On a cold April night in 1814 a British raiding force rowed six miles up the Connecticut River to burn the privateers of Essex, then known as Pettipaug. Before the raid was over they had torched 27 ships and taken or destroyed thousands of dollars’ worth of rigging materials. The raid resulted in the single greatest loss of American shipping of the entire war. During the War of 1812 the British navy’s blockade of Long Island Sound nearly shut down commerce along the Connecticut coast. 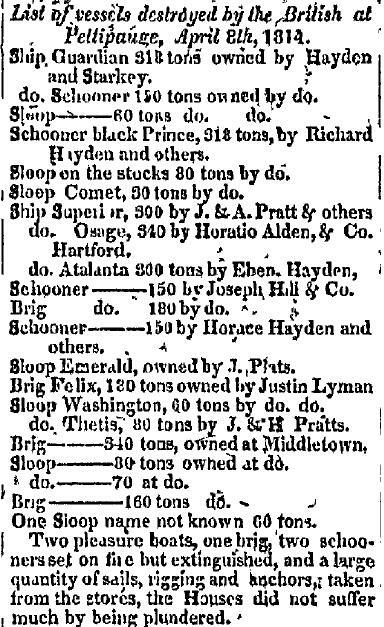 In shipbuilding towns such as Pettipaug many hard-pressed merchant ship owners were unable to carry out the normal coastal and West Indies trade that their livelihoods depended on. Some began arming their vessels as privateers. These were privately owned warships meant to attack and capture British merchant ships on the high seas. The captured vessels and their cargos were sold at auction and the profits split between the owners, the captain and crew, and the US government. For the young United States with its extremely limited federal navy, privateering was an important part of the war effort. Despite the obvious risks, the building and financing of privateers represented a potentially lucrative investment opportunity while also serving the national cause. Pettipaug was already a well-known shipbuilding center. That several vessels were now being armed and new privateers were being built there did not escape the Royal Navy’s attention. But a raid on Pettipaug would not be easy. 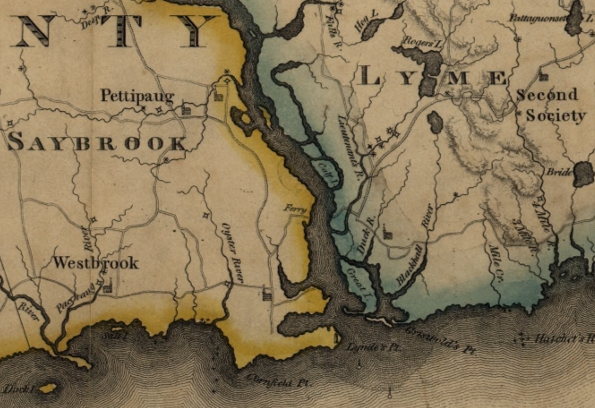 Essex is located six miles up the Connecticut River from Long Island Sound and a great sand bar at the mouth of the river prevented large naval vessels from entering. A raiding force would have to penetrate deep into the American heartland without the direct support of warships. Still, the British recognized that the chance of destroying a large number of privateers in one place, rather than having to hunt them down one by one on the high seas, was worth the risks involved. The raid was led by Captain Richard Coote of HMS Borer and involved crews mustered from four British warships of the squadron blockading New London and the Sound. They anchored off the mouth of the Connecticut River on the evening of April 7 and dispatched 136 sailors and marines in six heavily armed ships’ boats. Their first task was to secure the fort at Saybrook, which dominated the mouth of the river, so the raiding force would not be trapped on the way out. Unbelievably, two years into the war, the British found the fort without a garrison, guns, or ammunition. They continued to row upstream against wind and tide, arriving on the Pettipaug waterfront at 3:30 the next morning. No one in the sleepy village had expected the war would be brought so far inland. But here it was. According to a report published in the Connecticut Gazette a few days after the raid the British made a simple ultimatum to the town’s people gathered there in the wee hours. “Captain Coote informed them that he was in sufficient force to affect the object of his expedition, which was to burn the vessels; and that if his party were not fired upon, no harm should fall upon the inhabitants, or the property unconnected with the vessels…” In other words, the message was, stay out of our way and you can keep your town. The good people of Pettipaug looked at the marines, did the math, and withdrew. Quietly, riders were sent out into the night to seek military assistance from New London and surrounding communities. As British marines secured the town, sailors set to burning ships and removing naval stores from waterfront chandleries and warehouses. They also took the town’s considerable stocks of West Indies rum, an important commodity in an age when soldiers and sailors on both sides were issued half a pint of rum a day as part of their compensation. As the harbor blazed throughout the night, several heroic but futile attempts were made to save individual ships by towing them out of sight or extinguishing flames with buckets of water. Despite these efforts, however, by 10:00 the next morning the British had torched 25 vessels, keeping meticulous records of the names, tonnage, rigs, and potential armaments of each, from the 400-ton ship Osage to 25-ton coastal sloops. They loaded the stolen chandlery supplies and rum into two captured privateers, the brig Young Anaconda and the schooner Eagle. With militia from neighboring towns beginning to reach the area, it was time for Captain Coote and his men to make their escape. As the British towed the two captured ships down river against the wind on a falling tide, the Young Anaconda went aground a mile south of the town. Its cargo was transferred to the schooner, and the brig was torched. Despite being exposed to sporadic musket fire from shore, Coote decided that proceeding through the narrower stretch of river farther downstream in broad daylight posed a greater risk than waiting for the cover of darkness. He anchored the schooner and his boats and waited for nightfall. At sunset the British transferred the stolen supplies and rum to the boats, set fire to the schooner, muffled their oars, and began slipping downstream under cover of darkness. US marines dispatched by Stephan Decatur from New London had begun to arrive, along with federal troops and additional militia and volunteers. Several artillery pieces were quickly set up on both sides of the river. The British came under increasing musket and cannon fire from both banks. Two British marines were killed as the boats ran the gauntlet, now illuminated by bonfires and picket boats with torches. The musket and cannon fire from the narrows (today spanned by the I-95 Baldwin Bridge) was intense. Coote reported, “I believe no boat escaped without receiving more or less shot.” Yet the black of night and the swift outbound current enabled the British to drift silently past the fort at Saybrook, drawing only ineffectual parting shots from the defenders now gathered there. By 10:00 p.m. the raiding party had reached the safety of the British warships. For the loss of only two men killed and two seriously injured the British had torched more than two dozen American ships and taken or destroyed thousands of dollars’ worth of supplies and equipment—not to mention all that rum. It was perhaps one of the most successful small boat raids in history. Four months later the British bombarded Stonington. 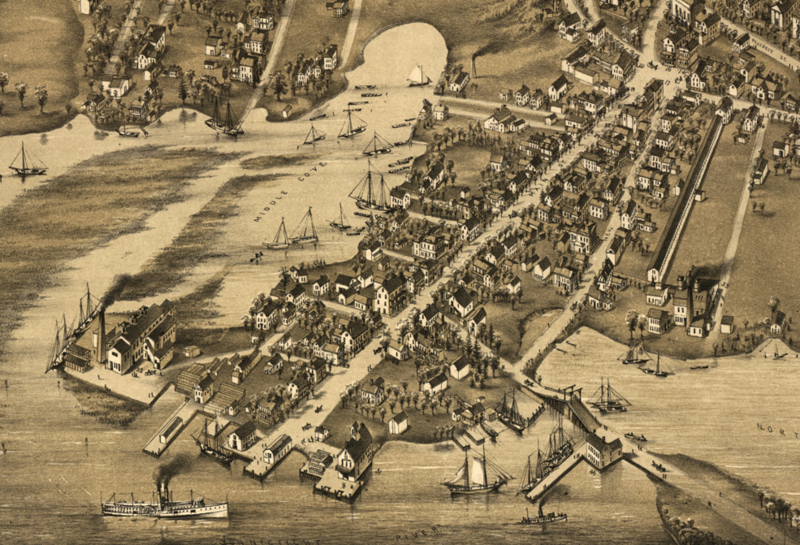 Unlike the strategic raid on Pettipaug, the attack on Stonington was a punitive bombardment of an extremely exposed, and as it turned out tenaciously brave, coastal town. Two weeks after that, on August 24, the British burned the nation’s capital. The raid on Pettipaug had been eclipsed, and the town did its best to forget this dark chapter in its history. Within two years it had changed its name to Essex, and the raid passed into obscurity and folklore. Jerry Roberts, formerly the executive director of the Connecticut River Museum. “Connecticut and the War of 1812.” New London County Historical Society, 2016. Link. Marsh, Major Ely. 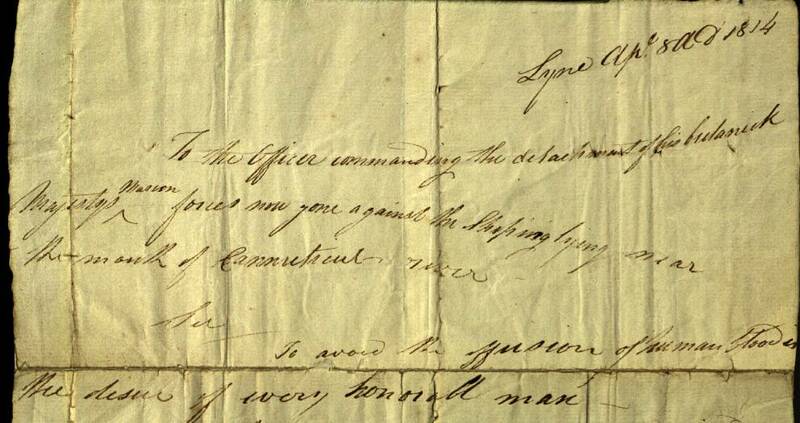 “Manuscript: Request for Surrender,” April 8, 1814. Connecticut Historical Society. 1814 New London. Pettypaug Point. Brooklyn, NY: Privately Printed, 1881. Link. Roberts, Jerry. The British Raid on Essex the Forgotten Battle of the War of 1812. Middletown, CT: Wesleyan University Press, 2014. Anderson, Russell F., Albert Dock, and Essex Historical Society. The British Raid on Essex: April 8, 1814. Essex, CT: Essex Historical Society : Hills Academy, 1981.